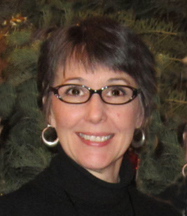 Lora Rocke is a quilt artist from Lincoln Nebraska. 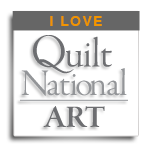 Her quilt Kathryn, Katy, Katie, Kate was in Quilt National 2009. 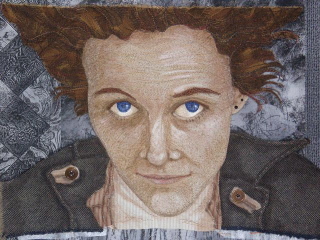 She continues her creative work in fiber with a focus on portraits. We asked her a few questions about how she works and what inspires her. How does your art fit into your daily routine? The greatest boon to my productivity was discovering that my brain is not creatively active in the morning. After my first cup of coffee, I can dive into mundane, day-to-day business: updating my website, answering emails, filling out forms, paying bills etc. I am efficient, single-minded and able to multi-task. But by mid-afternoon, my creative side takes over, I can almost feel my brain switch over to the right side. Working intuitively, choosing fabric and thread with a “skwinty” eye, I imagine what each will look like when applied to my current portrait. The music gets louder and my focus turns to shape, color and texture, and I will gladly stay on this path until early evening (unless someone interrupts with a “What’s for dinner?”). Why do you use textiles/quilting as a medium? I have an affinity for getting my fingers into any project. Early on it was charcoal & pencil drawings, then batik work with the dipping and dying of fabrics, even my painted portraits involved moving the paint around with my fingers. The tactile nature of fabric and thread has always intrigued me. With years of practice, trial and error and some successes, I found that thread and fabric can be used much like pen, pencil, ink and paint. With patience, I can create an intensely stitched face that has the same depth, detail and personality. What inspires and motivates you to make art? The main inspiration for any piece that I do, whether it is a commissioned piece or one for exhibition, is a personal connection. Is there an emotion that touches me? Do I feel that it can clearly be portrayed through fabric and thread? It sounds silly, but I look for the story in each piece that I stitch. Who are they, what are they thinking, what do they want to say and how can I communicate that? 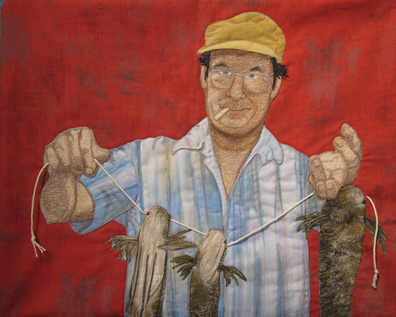 In the end, I love the look on the faces of those who view the completed portraits, and the questions that they ask about those people that I have stitched. I have just completed several pieces for exhibition. These “Ordinary People” include a fisherman and his catch, two “trick-or-treaters” and a little girl after a birthday party. The most intense piece, done in thread and appliqué, is a triptych of a little boy and his self-styled haircut. The intimate images in my portraits have stories to tell. Captured in dense freehand stitching and cloth, I strive to create the face of a loved one, the romance of childhood, or the remembrance of a lost friend.